Old old piece of art that i found XD tis mightyena! Simply stunning! 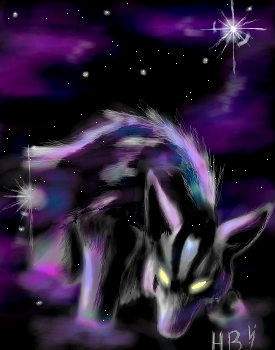 The use of the violet against the dark sky, and how mightyena has a phantom sort of appearance. It is amazing! Ohh that is very cool. The eyes are a nice touch. Keep it up. Presents medal. *Jaw Drops* "Holy Crap, that's an awesome pic!"